A couple of months ago I lightened my hair, going from black to a warm brown with a few highlights. This is something I’ve done before and yet I never seem to learn my lesson. Not only did I have to spend a good six hours in the hairdressers, it also cost me a small fortune! I am a self confessed dye addict. When I get the urge to dye my hair, there is no time for booking appointments I simply have to run out and buy a box from my local Boots. This is a bad idea, trust me! If you are thinking of dying your hair black then you seriously need to understand how hard it is to change it back. Don’t get me wrong I loved having black hair but it came with challenges. So why I am I telling you all this? Well, in order to get my hair lighter I had it cleansed. This sounds lovely and nourishing but it’s not, essentially it strips the old dye out and you’re left with a bit of a patchy mess. On top of this I then had an all over colour and highlights, so as you can imagine my hair has suffered some serious damage. It wasn’t exactly in the best condition to begin with but now it’s beyond dry. With this in mind I’ve been reaching for anything that can put a bit of moisture back into my locks. 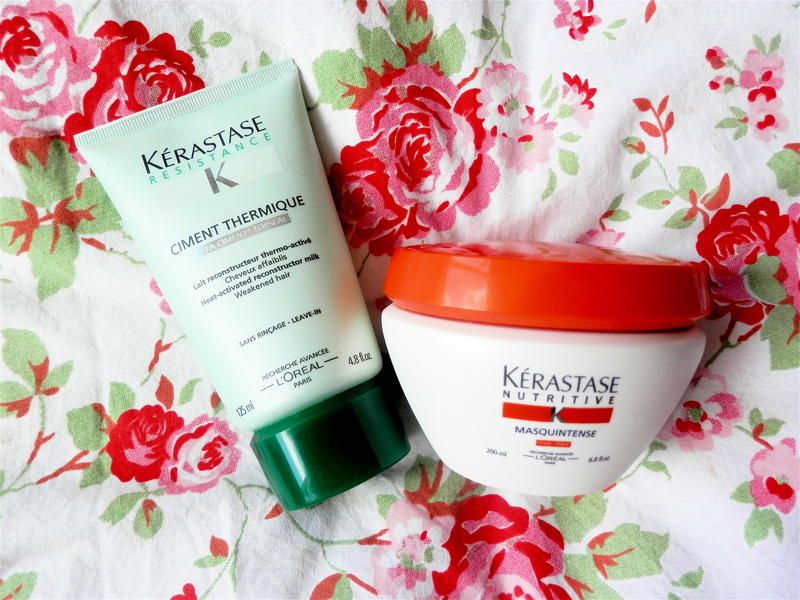 I’ve been using two Kerastase products in particular for this. 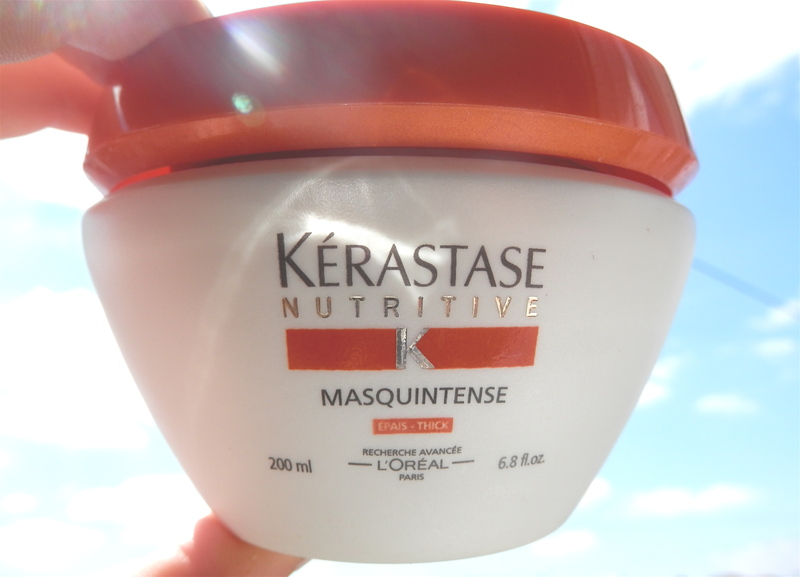 Kerastase Nutritive Irisome Masqueintense (£24.20)- I apply this after shampooing focusing mostly on the ends and leave it on for around 3 minutes. This product is designed for thick hair and claims to improve manageability whilst also protecting hair from the damaging effects of heat styling. It definitely does this, I tend to blowdry my hair straight and this conditioner makes it feel smoother. I have to use this every wash not only because my hair is damaged but the water where I live (Greater London) is less than kind to hair! However, if you have more manageable hair I’d say use it once or twice a week. 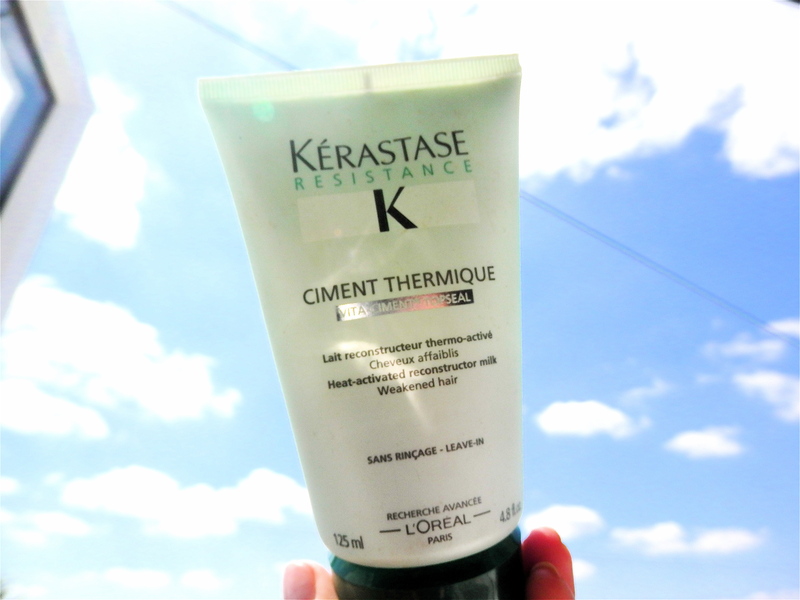 Kerastase Ciment Thermique £16.47 – This is basically a leave-in milk that you apply to damp hair before styling. It claims to repair split ends and whilst I do think it helps to prevent them, I’m not convinced anything other than a pair of hairdressing scissors can truly solve that problem! I apply this to the ends of my hair and then proceed to blowdry and it definitely makes the process a whole lot easier. I’m not sold on the smell but it’s not bad enough to put me off using the product. This isn’t a cheap option but you only need a small amount and it lasts for ages. Whilst I do love these two products they aren’t exactly cheap. I would love to know if any of you have any suggestions of deep conditioning hair masks or conditioners that are available in the UK?! Please let me know!